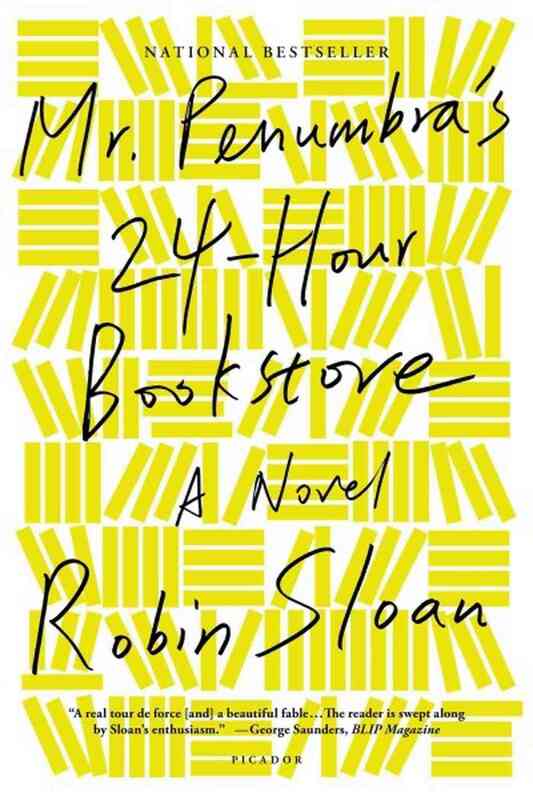 Mr. Penumbra’s 24-Hour Bookstore, by Robin Sloan – ruru's ruminations. Beautiful, quirky, and utterly engaging. Admittedly, the book title’s typography and design is not great – it literally screams ostentatious ‘teenage hipster literature’ all over the front cover (although that may be the point, if teenagers are the target audience). A slight fidget, an inward cringe, a heavy sigh. Is that even a genre??? Yep — John Green, Stephen Chbosky… You get the gist. The type of book you would place, angled, next to a cup of artisanal coffee to snap an Instagram photo just for hipster cred. (Goodness, I just cringed again. Hipster cred? Don’t kill me. It’s funny how teenage fads die off so quickly – the term ‘hipster’ was once heralded by throngs of eager adolescents but is now shunned by the very same people who now call themselves anti-hipsters, a.k.a. a scathing i-am-a-true-hipster) Not at all to say that the likes of John Green aren’t great writers in their own right, but in a way they’ve become overhyped and symbols of ‘cool’ (unfortunately J.D Salinger and Fitzgerald have been lumped in their ranks, but I’d hate to classify these classic masterpieces in a genre so contingent upon the whims of teenagers). Mr. Penumbra’s 24-Hour Bookstore, on the other hand, is different. So markedly different. And yet so very similar. It’s strange. It was only by a stroke of luck that I picked this up at the National Library under the ‘Recently Read’ shelf . Under ordinary circumstances I would never have picked up this book – quirky, light-hearted, and yet strangely sentimental fiction just never truly appealed to me. I like weightier books, ones of historical significance that lend themselves to a greater cause, that convey some deep meaning about life without petty simplification to make it more accessible (eg. feminist literature, utopian/dystopian fiction, etc, etc. ), admittedly due to a little pomp and condescension on my part. But please, do not make the same mistake I did. Pick up this book. Yes, it reverberates with child-like magic and surreal innocence-of-a-sort (a naivety that somehow wiggles its way into the witty, humorous, and utterly relatable dialogue). Yes, it does involve a mystery – part believable, part out-of-this-world. Yes, it does make references to Harry Potter – but it also mentions Google, dragons, and 500-year-old books all in the span of one page. Robin Sloan somehow manages to fuse childish wonder with serious, mature appeal (sort of). It’s very well crafted – certainly not the best plot with the most exciting twists and turns (a far throw from Harry Potter, I might say – although that would be comparing apples to oranges), but definitely unpredictable and magical. Its real wonder lies in its realistic setting. With each unexpected turn and (laughably childish) leap of adventure, the reader’s expectations are tempered with intermittent dialogue filled with 21st Century banter and technological jargon. Somehow these two typically incongruous things coalesce into a sort of unique fabric – these hackneyed ideas are each clichéd and overused in their own domain, but somehow end up complimenting each other in an absurd fashion. Of course, there were times I felt Sloan was stretching it a bit – he was a little too eager, a little too idealistic. He clearly wanted to convey a message or pride himself in burying some hidden nugget of wisdom in between the lines of his masterpiece. But sometiems this made it seem too much like a children’s magic book (think The Secrets of the Immortal Nicholas Flamel) and rendered it a little contrived. I mean: “All the secrets in the world worth knowing are hiding in plain sight”? Seriously? Are we really going to make childish aphoristic observations here in an attempt to impart some deep, far-reaching message? To be fair, it did contribute to the wizard-magic-castle-and-the-works appeal of the book. It depends on how you view it. I personally felt like I was being treated like a 7-year-old (with a mix of mock disgust and concealed delight – the child in me was dancing around in glee). Personal egotistical doubts notwithstanding, it was a brilliant book. Full of light-hearted entertainment, but yet not overly indulgent in mindless banter. For those of you who like to consider yourselves ‘hipsters’ (or something of the sort). This is also for you. Who knows, it might just earn you hipster cred (! self loathing.) next time you go to the neighborhood coffeeshop.